Two years ago, Andrew Landrum moved to ABC Financial Services of Sherwood for many of the same reasons he had been part of the Acxiom team. Seth Jensen didn't join the Slim Chickens restaurant team on the ground floor, but he wouldn't have to take too many stairs to reach his office. 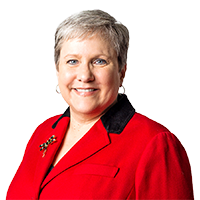 Debbie Henry's introduction to the financial side of the health care industry came more than three decades ago. Reathel Privett started work at Union Bank & Trust in Monticello as a 17-year-old teller back in May 1980. The part-time job marked the beginning of a career and the establishment of a vocational home. Mel Sansom has decreased debt at Harding University by approximately $20 million over the last four years. 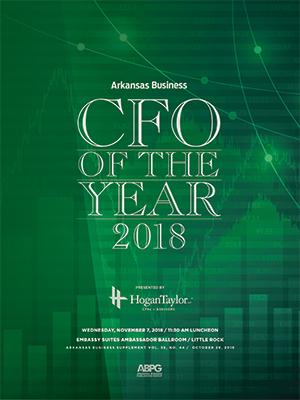 As global and regional economic issues continue to evolve, Arkansas Business shines the spotlight on chief financial officers. Over 53 years as a principal at Jordan Woosley, Joe Woosley has taken pride in the firm's growth and the chance it gave him to look out for clients like surviving spouses at risk of falling prey to fraudsters. Jim Fink has had an enviable and diverse accounting career, having worked at one of the Big Four accounting firms, at two Arkansas frozen treat companies and now at a private Christian school. Susie Koehn is still abuzz from the mountaintop experience of helping make the initial public offering happen in May for Little Rock's BSR. Since Todd arrived the number of dental clinics under management has grown from 27 to 74 practices in Arkansas and Missouri. Rock Dental has about 500 employees. Jim Acuff's goals for Wilson & Associates include expanding, attracting the best people and having the best technology to support the firm. Advanced Cabling has been a perfect fit because, as the company's first CFO, Jenny Griffin has built the financial infrastructure her own way with a staff of four. What Jon Dor enjoys about his current job is that he gets to do what he loves for an organization that's making an impact. A two-year mission trip to southern Argentina during his college years resulted in an “epiphany” for Corey Moline: Engineering wasn't the field he needed to pursue. Christine Murphy wanted to be a scientist, but she soon discovered she had chemistry with numbers. Credit unions brought Eric Mangham to Arkansas early in his career, and his plan is to stay right where he is. Chris Wewers started on a banking career as a part-timer while in college back in 1991. His passion for the lending business hasn't waned during those 27 years. Paul Cherry is having the time of his life at Central Baptist College in Conway. Don Swanson called being involved in doubling the size of Pulaski Academy's campus “almost overnight” his greatest accomplishment.